Create a boundless field of tulips with these sweet favors. We placed bulbs (you can buy them online in the fall) in votive candleholders with enough water to cover the roots, then added paper blooms and a vellum seat assignment to each one. Download our templates, and print onto card stock; then cut out with scissors to create patterns. 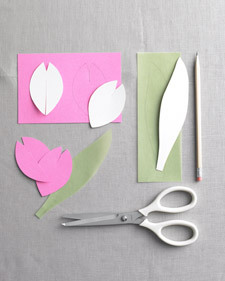 For each tulip, lightly trace petals onto pink cover stock or heavy paper (you will need two different shapes for each flower: Petal A with a bottom slit, and Petal B with a top slit). Cut out with scissors, and cut the slits as marked. Interlock the two shapes, sliding the bottom slit from one into the top slit of the other. Cut an 18-inch length of 16-gauge green cloth-wrapped floral wire for a stem. Apply glue to one end of the wire, then secure to the bottom of the petals; let some glue seep between the two petals. Hold briefly for glue to set slightly, then let dry. Trace a leaf onto green vellum, and cut out with sharp scissors (use long, smooth strokes). Write a guest name and table number on the leaf. 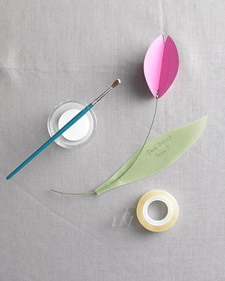 Use double-sided tape to attach the leaf to the stem near the bottom, and fold the base of the leaf around the floral wire. Slip the stem into the leaves of the potted tulip bulb, and push just the tip of it into the bulb to anchor it.